I wasn't lucky in selecting my parents and step parents. Or, maybe I was. Otherwise the good things in my life might never have happened. My Mother was apparently what is now referred to as a "Free Spirit." Whatever that means. She managed to be on her third husband by the time I was 8 years old. This caused me to attend many different schools due to forced living with stepfathers, uncles and grandparents in the states of California, Arizona and Missouri. I was lucky to attend three different high schools in four years. When reflecting back on my high school years I always recall the luck I had with football teams. My 1949-50 freshman year was spent at Excelsior Springs in northwest Missouri. I lived 15 miles away with a step uncle and was forced to ride a bus for an hour each way. The town was mostly tourist resorts like the Elms Hotel which featured swimming pools, spas and baths in mineral water that poured forth from the famous local springs. President Harry Truman and First Lady Bess frequently visited the Elms. My great uncle Elmer Burson and his wife Irene lived near the high school. It was at ESHS that I realized that there was great beauty in the young ladies. I recall falling in love, of some sort, with Teresa Crabtree and Jo Ann Cochran and facing off with the Dickey brothers in the lot across the street from our high school. My real luck was the football team winning the 1949 Missouri River Valley Conference. I contributed nothing to their championship but walked proudly like all students of the high school because of the great season and winning bowl game against North Kansas City. During the sophomore 1950-51 year I was living with my grandparents in Yucaipa, California and was bussed the seven miles down to Redlands High School. My grandfather William Eugene Burson was a building contractor who built homes in Yucaipa Valley. I worked as an apprentice for 75 cents an hour performing all kinds of jobs included in house building during the summer of 1950. RHS was a large school with probably 2000 students in the three grades. I made several lasting friendships, mostly with those who rode the bus from Yucaipa. Redlands was a beautiful city and probably still is. The San Bernardino mountains overlooked Redlands from about three sides and in those days the smog of Los Angeles rarely made it to the city. I played as a quarterback and defensive end on the JV team and watched the Varsity squad destroy all the opponents to win the 1950 Citrus Belt League Championship. I did not letter in football that year but received a gold football on a chain as a member of the team. Summer of 1951, I traveled to Missouri with my uncle Clinton Burson on vacation. I respected him because he had joined the Air Force during the war and attended flight school. He was flying the P-51 Mustang in advanced training when the war ended in 1945 and he was discharged. When we arrived in Missouri, the rivers were out of their banks and the entire northern half of the state was mostly under water. We could not drive to my mothers home for several days. A bomber wing plant was being built in Kansas City and the cost-plus contract offered high paying jobs. I hired on as a plumber apprentice for about $2.25 per hour and double time pay on weekends. With my lucrative job I decided to work as long as I could and attend my high school junior year in Missouri. Ray County assigned high school age students living in my area to attend high school in the town of Lathrop. I registered early and signed up for football. My school schedule was in college prep classes with study hall in the first period and football every afternoon. 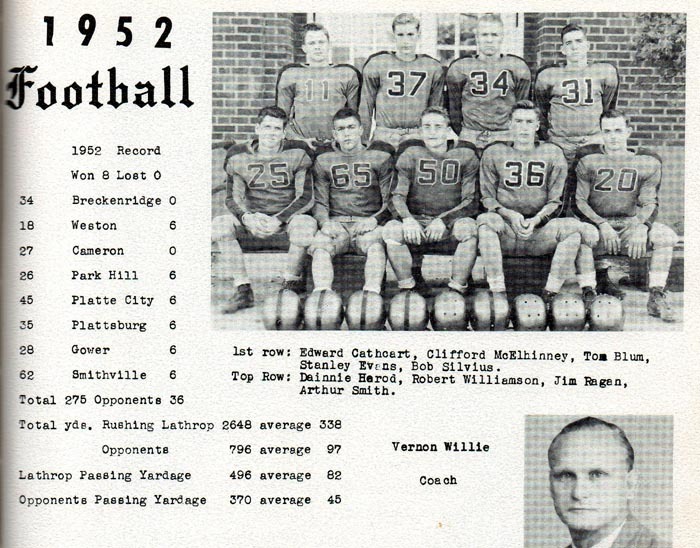 The football coach, Vernon Willie, was a big, gruff lineman with a no-nonsense, winning mind set. I liked him immediately. He made me first string defensive end. Three non-conference games started the season off and Lathrop won all three. Our first conference game was with a tough Parkville team. It was a knock-down, drag-out, driving rain and sea of mud competition. There was no score during the first three quarters of the fierce defensive battle. It was in the fourth quarter and Parkville had the ball when I was untouched on a hard blitz from the right side. I was within a step of the wingback when he was trying to take a hand off. The blinding rain caused him to bobble the ball which dropped and bounced up into my hands. I was already running full speed and continued full speed through the mud for 40 yards until crossing the goal line. The defense had finally scored! We won 6-0. We beat Plattsburg the following week 19-0 and were the only team in the State that had not been beaten, tied or scored upon through the first five games. No one had scored a point on us. The next 4 games were won handily and Lathrop became champions of the Northwest Missouri Seven Conference. My third straight high school to win their respective football conference championships! LHS 9 wins 0 losses. 3 wins were non-conference games. It was an easy decision for me to return to Lathrop for my senior year of high school. After all, we still had almost all of the best members of the 1951 champions so our team would surely win the conference again. That is just what happened. We repeated with a 8 and 0 record, which included 2 non conference games, and won the Northwest Missouri Seven Conference Football Championship for the second year in a row. I was going both ways-offense and defense. At the end of the season, most of the players were suffering hobbling injuries. The hard fought games on the frozen ground had taken a toll during the last three games. I had a dislocated shoulder and wore a iron rebar rod contraption welded together by the town blacksmith to prevent the shoulder pads from hitting my shoulder and clavicle. It did not work well. Every time I hit someone it felt like I was breaking a rib as the circular rebar under my arms and around my chest was slammed into me. Jerry Pulley was the assistant coach who helped me stay at my both way positions for every quarter of every close game. Most of the great players from the years at Lathrop High School are now gone. But the records they established are still alive. We had outstanding offensive backs like Cliff McElhinney, Tom Blum, Andy Mott, Sam Breckinridge Art Smith and Bob Silvius. Stalwart and reliable linemen like Bob Williamson, Stan Evans, Gene Stout and Jim Regan made holes for the running backs to gain yardage. And, the all important defense prevented the opposition from scoring. What a Team! Very few people are lucky enough to say "My High School won the football conference championship 4 straight years."